This unique Bamboo Serving Tray includes three removable ceramic bowls and 3 small bamboo serving spoons. The bowls are inset in the board for stability but are removable to re-fill and/or clean. The board has gracefully rounded corners, a milled juice grove, and permanent clear protective, non-slip feet. It's a great size for a casual party and makes an excellent wedding or welcome gift. Lifetime Warranty. HIGH QUALITY - Organically Grown Bamboo Serving Platter with cheese Markers - 3 Ceramic Bowls with Bamboo Spoons for Olives and Appetizers! MEASURES 13" Wide x 13" Deep and has a Milled Groove Around the Edges of the Cutting Surface to Collect Juice from Soft Cheeses and Fruits! 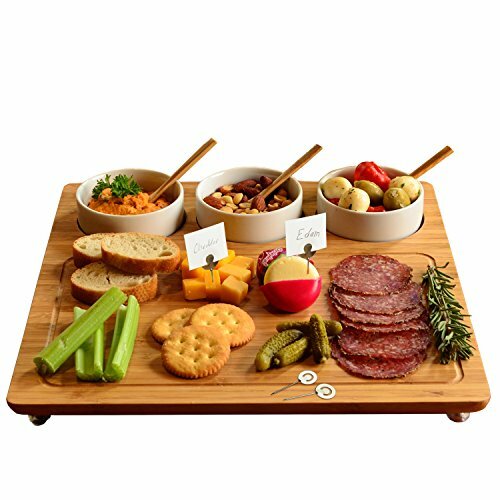 A GREAT GIFT IDEA - Surprise Your Friends and Family and Offer Them a Stylish Way to Enjoy Their Favorite Cheeses & Appetizers - Makes an Incredible Housewarming, Engagement, Wedding, Anniversary, Retirement, Birthday, Christmas, Holiday, or Hostess Gift! DESIGNED by Picnic at Ascot in the USA -Backed by our LIFETIME WARRANTY - Clean with Warm Soapy Water or Damp Cloth - Food safe - FDA Approved ! CLICK PICNIC at ASCOT at Top of Page to Visit Our Amazon Store & See the FULL RANGE!